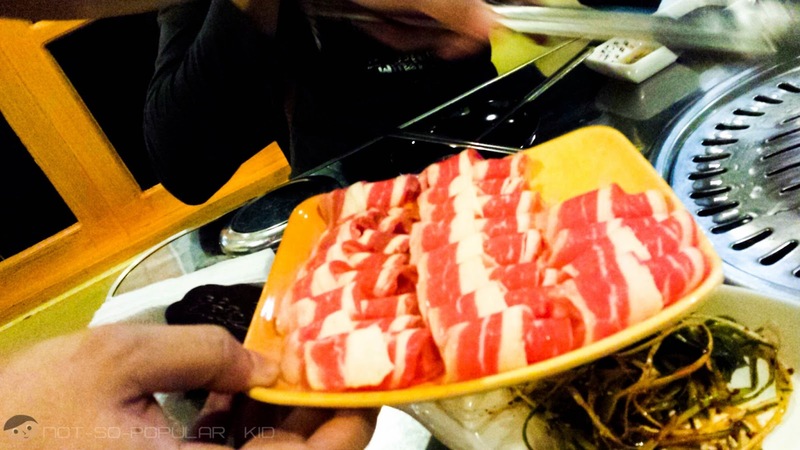 Samgyupsal is the Korean term for pork belly. The owner of the place probably decided to add Filipino touch to it, and merging the term "salamat" with it. 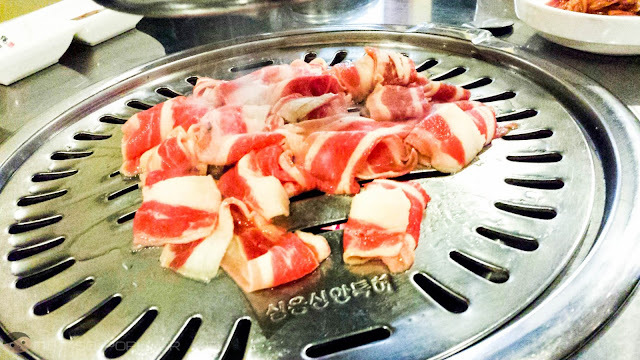 Hence, we have the Samgyupsalamat which if we translate correspondingly, we'll get Pork Belly Thank You. Sensible, corny or funny? What do you think? 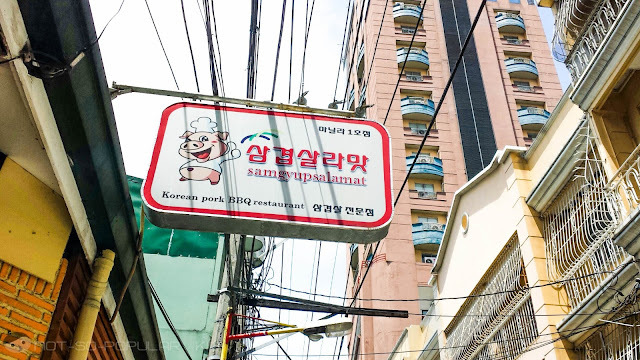 UPDATE (July 2017): There is another branch of Samgyupsalamat that opened up along Leon Guinto Street. This is a bigger and better branch compared to this one. Still, both are accepting customers, so you will no longer need to queue. Also, please do take note that prices here are outdated. I have yet to visit this place once again. In case you are wondering where will you find this place, you may scroll down below and take a look at the map. However, if you aren't that eager to know, let me proceed with my insights about the place. By looking at the photo, you will notice that this part of the restaurant makes an effective use of natural lighting, which I very much appreciate. 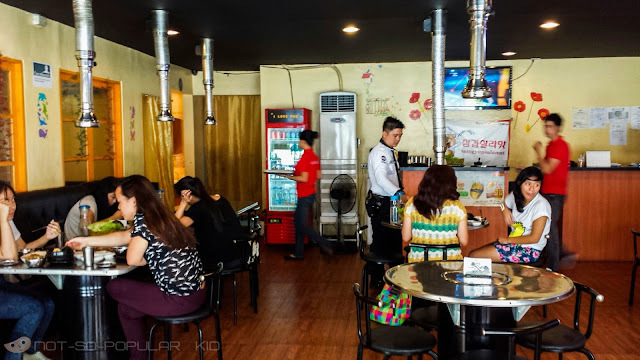 However, it is apparent that the place isn't much Korean-inspired (although there are some elements of Korean theme integrated). The owner probably wanted to put more weight on the practicality and simplicity of the restaurant. Also, since the place will cater to students, he probably thought that they would want it casual enough to be highly comfortable. Anyway, what I love about the place is that they also have private rooms for customers, coming in a larger group (e.g. 8-10 people); hence, you can be silly with your friends without worrying of being judged by others. Check out the unli promo of Samgyupsalamat! It was odd that they named this "Happy Hour" because you usually associate it with drinking. Anyway, I think they call it that way because freebies make us happy. Free rice may not sound so convincing, but if you'll order it there, it will cost you P30. Similarly, that's the price you'll "save" when you avail of the promo. 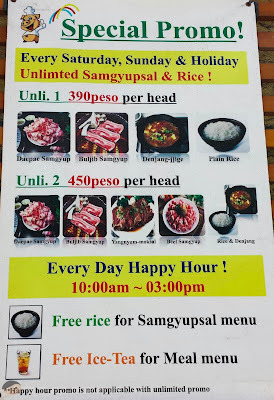 Unlimited samgyupsal and moreAlright! 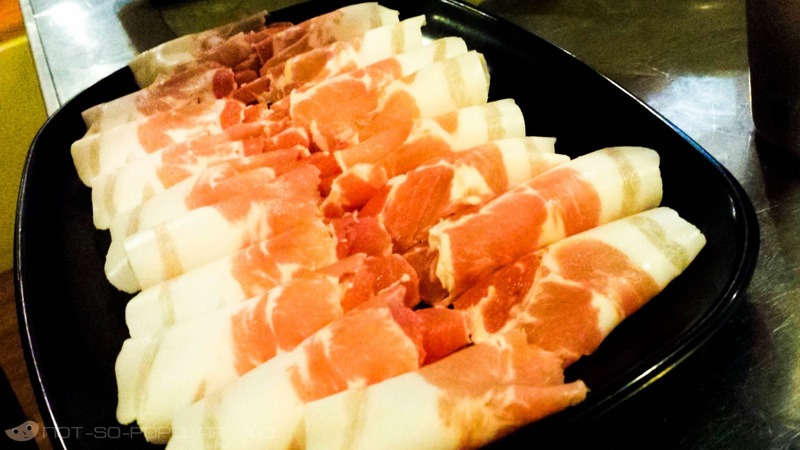 Let's start exploring by starting with the appetizers. 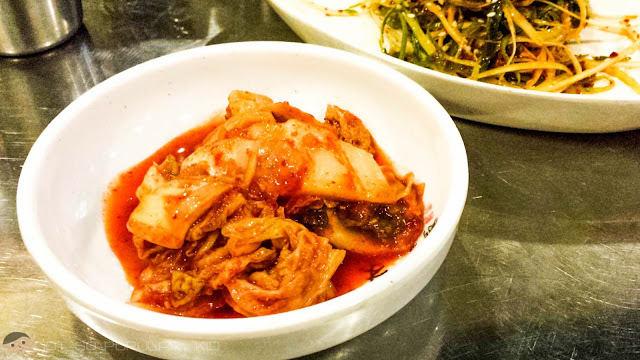 With a minimum order of two (2) Samgyumsal Meals, you will be given a set of appetizers consisting of three small dishes: the Kimchi and two other ones I forgot the name of. I forgot to take photo of the other one, but to give you an idea it tasted and looked like the Filipino Atsara. Anyway, the taste of these appetizers were fine, but there was some point where the spiciness was too much for me to handle. 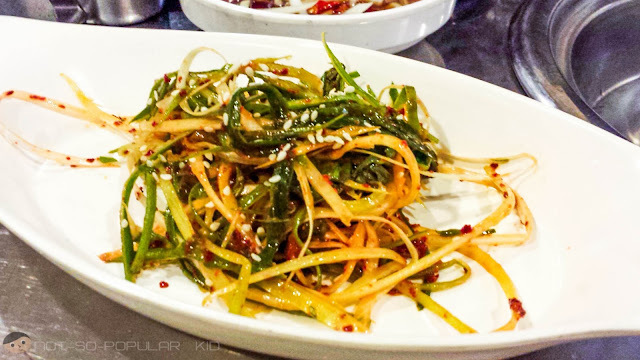 Now, let's proceed with the main dish we ordered, but you need to forgive me because I wasn't able to completely remember the names. Also, since we were subject to budget constraint, we just ordered the minimum meal in order to take advantage of the free appetizers. It's hard to really differentiate the taste of the pork and beef because usually it depends on how good the sauces are that go along with these grilled meat. Luckily, I really enjoy the taste of the sauces (i.e. benchmarking with that of the sauces in Maru Korean Restaurant), which made me appreciate what I had. Do I recommend the place? Well, definitely yes! In order to take advantage of the promos, I suggest that you group yourselves into 4 or 5. 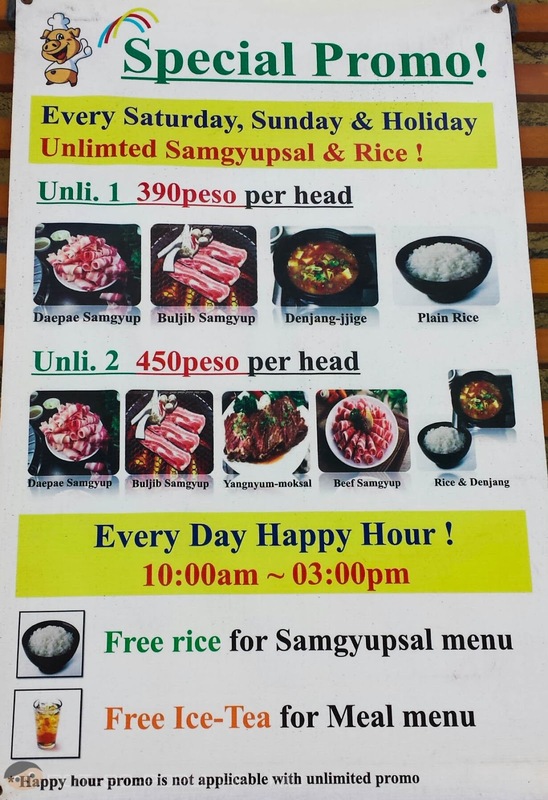 Order 2 of the Samgyupsalamat Meal, then order extra rice. With this, you will spend around P100-P150 each depending on your chosen meals. However, take note that you will not be entirely full, but your thirst for food exploration may be satisfied. In case that such promo does not exist anymore, prepare to spend at least P250 each in a group of 4. It's very easy to find the place. Use the map above to guide you. 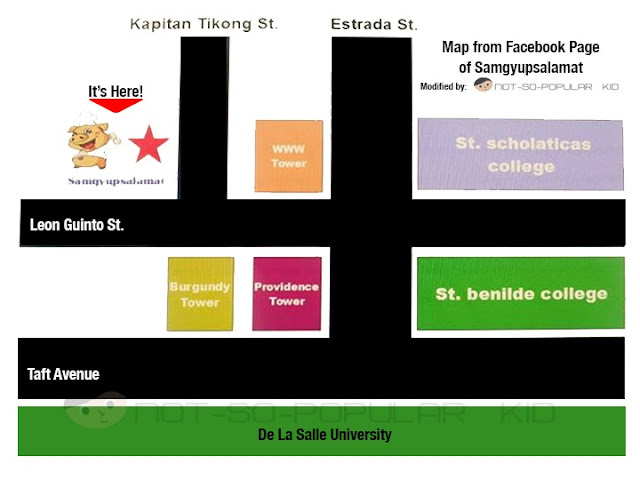 If you are coming from either St. Benilde or St. Scho, exit via Leon Guinto St. and just walk straight then turn right after the WWW Tower. If you are coming from DLSU, you may want to pass by Burgundy Tower (which is supposedly prohibited), then walk straight head, you will notice it by the signage.